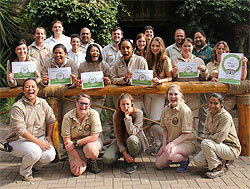 CANGO WILDLIFE RANCH AWARDED TRIPADVISOR CERTIFICATE OF EXCELLENCE FOR FIVE CONSECUTIVE YEARS!!! Oudtshoorn, South Africa – 20 May 2015 – Today Cango Wildlife Ranch announced that it has been recognised as a TripAdvisor® Certificate of Excellence Hall of Fame winner. The Certificate of Excellence award celebrates excellence in hospitality and tourism and is given only to establishments that consistently achieve great traveller reviews on TripAdvisor. The ‘Hall of Fame’ was created to honour those businesses that have earned a Certificate of Excellence for five consecutive years. Winners include accommodations, eateries and attractions located all over the world that have continually delivered a superior customer experience. Cango Wildlfie Ranch has been running for over 20 years, and each year endeavours to grow through constant developments, expansions and improvements. Cango Wildlife Ranch prides itself in being an accredited member of PAAZA (African Association of Zoo’s and Aquaria) and institutional members of WAZA (World association of Zoo’s and Aquaria) which is upon invitation only. They house over 90 species of animals which receive optimal care by dedicated staff all whilst creating a platform to educate thousands of people on an annual basis on species, conservation and environmental awareness. The huge ears of the bat-eared fox are so sensitive that they can pick up the sounds of a beetle in its burrow.